Would you be able to send me a PM with the Propaganda kit in please so we can try it here? Also would you be able to record a video showing the issue you are having with Files please? 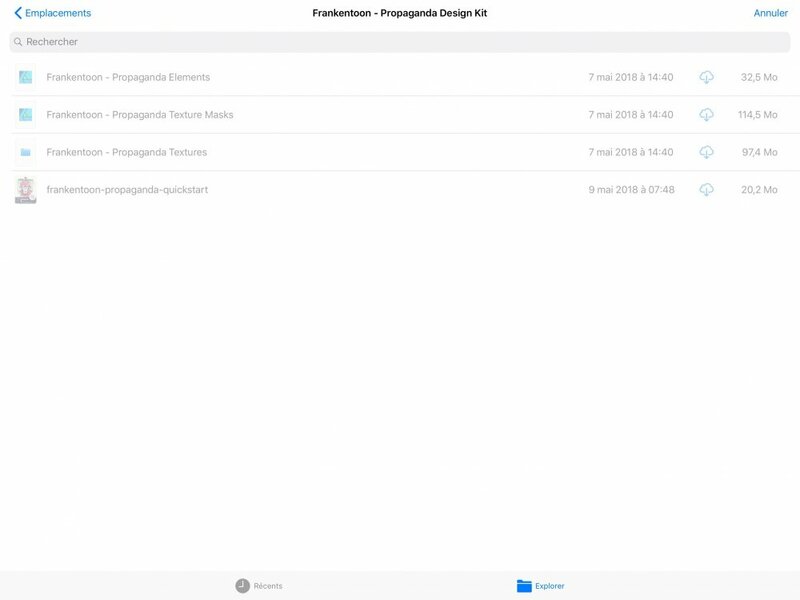 Hi everyone, I have the exact same same problem, I purchased Frankentoon Propaganda﻿ pack, and when i tried to import it in AD on my ipad pro 9,7 the app crash, I tried to uninstall the app and reinstall it but it keep crashing when I import the pack. I didn't face this problem when I have imported the kit on AD desktop. Thanks Enrique for the awesome Propaganda﻿ pack, I love your work and I have purchased almost every pack in your store and it's all great! Thanks a lot for your purchase and your constant support! I'm really sorry you're experiencing this. Apparently, it's only happening on newer iPads, since I haven't had any troubles when I import the pack into my older 2015 iPad Pro. I've had a couple of crashes on 2017 iPad's but the Styles and Assets got installed after restarting the app or the iPad. I had this problem too, but trying and trying to import the assets, eventually they was imported, without crashing the AD in my 2017 iPad Pro. i think there where an issue that AP had to be installed on the iPad too.. for some reason. Anyway, now it’s there and works great.. I hope they will fix this issue soon, I tried reinstall AD but it still crash, and I even tried importing the style on AP for iPad but same problem the app crash, maybe it is an IOS bug. Is there maybe any chance to split the files into smaller packages as a temporary fix? The 30 mb elements file loads without problems but I can’t get the two bigger ones to work. My 2018 iPad crashes every time - I tried it at least 20 times including restarting and reinstalling the app and also restarting the iPad. Hello, I’m in the same situation as SaphiLC I purchased frankentoon's propaganda﻿ kit﻿ for my iPad Pro 9.7 two days ago and I was only able to import the elements pack. I tested the larger packs on my brother’s iPad Pro 10.5 without a problem, so I’m wondering if is not a memory issue, which I hope is not. A bug will be corrected sooner or later while a memory problem would make my device almost obsolete. Anyway, the styles are looking wonderful and they are really easy to use. I hope I will be able to use them in my work soon. Thanks a lot for your purchase by the way! I'm also looking forward to everybody being able of using this pack at its fullest on their iPads. Is it really clarified that it is a memory issue? As I said I had problems importing the assets with a large resolution. I can’t really check the size of the data but when I deleted the assets with a large pixel size I could import them without a hassle and also work with them. The problem is little bit different for me. I just cant select the file from DropBox. I made the IOS update (11.4.1) yesterday, maybe thats the problem? Any word on getting the Nature pack to work on a 2018 iPad? I can't get it to work at all. The first pack sort of imports - or at least claims to - but nothing shows up in the brush list. And the second pack won't load at all. Update. I didn't know you needed to be in the Pixel persona on AD for iPad to do the import... which the documentation does say, I admit. Actually, I was having a problem with Google Drive storing these files for some reason. When I downloaded them thru Box.com instead, they worked just upon opening. At least in AD. I still can't get them open in AP for iPad... but whatever. I've bumped the issue with being unable to import certain packs on the non-pro iPads with development. How do you mean you can't get them to open in Affinity Photo? Is it that they're greyed out and you cannot select them? If so does moving them onto an iCloud drive help? I have the same problem with importing frankentoon's propaganda kit (exactly masks and textures). My iPad Air 2 crushes when i try import files from iCloud, Dropbox or another clouds. If there are some info about this problem? It's really frustrating that I bought something and can't use it. I have the same problem with AD crashing on importing the Frankentoon's Concept Master Nature A Brushes (the Nature B Brushes imported without a problem). I'm using Affinity Designer and Photo on my iPad 2018 (iOS 12 installed). It doesn't matter if I start importing from Affinity Designer or by opening the file from the file manager. After a few seconds the app simply closes. I had issues with importing the styles from the propoganda kit - the asset masks took a couple of goes, but eventually loaded. The styles refused to bend to my will, so I divided them into 2 seperate style export files and these loaded o.k. A bit of messing around, but they are now on my ipad (pro 2018). This is still not been resolved, I have this issue too. Yeah, it seems they don't care, anyway I gave up on AD especially after I've seen that upcoming version 1.7 does not have any features from the 2014's road map. We do care. This issue is still with the development but there wasn't progress yet, sorry. Regarding the roadmap, it lists the features planned for the whole 1.x cycle of the app. We are still in v1.7 Beta. The remaining features there (the ones already implemented were removed from the list) will come in the upcoming versions.